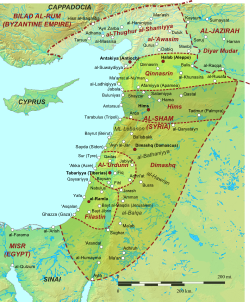 Major towns besides Tiberias included Baysan, Acre, Qadas, Tyre, Pella, and Jarash, and at times, Nablus. During the Fatimid era, the principal cities were Acre, Tiberias, Baysan, Beit Ras, Jadur, Fiq, Tyre, Lajjun, Faradiyya, Kabul and Saffuriya. It did not include Amman, or the southern part of modern Jordan. Jund al-Urdunn was bordered to the south by Jund Filastin. ^ a b Le Strange, G. (1890). Palestine Under the Moslems: A Description of Syria and the Holy Land from A.D. 650 to 1500. London: Committee of the Palestine Exploration Fund. pp. 30–39. OCLC 1004386.